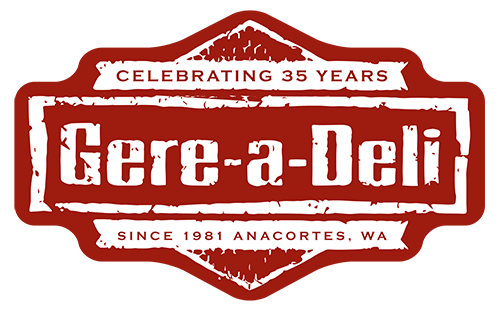 GERE A DELI | Feeding Anacortes Since 1981 – Celebrating 37 Years! The Gere-a-Deli has been Feeding Anacortes Since 1981. Located in Historic Downtown Anacortes, the Deli has remained a Family Owned and Operated Business. It’s No Secret to the Locals why the Gere-a-Deli is the Place to go for Lunch, or why they’ve been VOTED BEST the Last 25 years in a Row for the following: Best Deli Soup, Best Salad, Best Business Lunch, Best Quick Lunch, Best Chowder, Best Sandwich and BEST Catering!! The Friendly Staff, Original Nostalgic Décor and Traditional Family Recipes-Made from Scratch Daily are sure to Make Anybody Feel Right at Home. We Look Forward to Spoiling You!